It would appear that he likes the book, sitting on the blue sateen puff that my wife used as a comforter in college. Although, when I sit empty handed with the blue puff, or stop to sip coffee, he looks equally content. So his pleasure may be projection on my part. In any event, I have substantial reason to respect his opinion. He adores both my wife and daughter. This is a sign of taste and intelligence like little else. But more importantly, I like the book. Though I had not planned to take this long in editing, I am now reading things set down over a year ago. The words are strangers to me now, allowing me to be a more neutral judge. I tried to take a three-day weekend last weekend, to push through some or all of the rest of the book, but those hopes were dashed by events at my day job. (I am always hesitant to complain about the impact a murder has on me, as it seems petty and out of place compared to the impact it has on the family of the victim.) Then I tried to take last Thursday to work the book. Again, overcome by events. 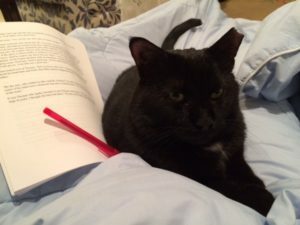 But this morning, with the fidelity of a rooster, Tippy-the-Cat got me downstairs and drinking coffee with a stack of pages and a red pen. As I get close to the end, the prospect of sharing a completed draft gets a little intoxicating. The idea of resuming work on Postmarked in Paris, the novel I started in the fall and paused to stay on task editing, also grows intoxicating. I know who the two main characters are. I know their stories. I know how and why they found their ways to Paris. But I want to know them. Really know them. I want to see them unfold into real people, the way the charcoal sketches of the characters in Splendid Children came alive for me, like Pinocchio, and started doing things based on their own logic – things I had no idea would happen when I wrote the first words. One hope for this blog has been to connect with other writers, since I have not managed to join a writers’ group of any kind. To learn how you edit. How you create. The rhythms that help you make something out of nothing. With the fidelity of a rooster…[laughing]…I like that!